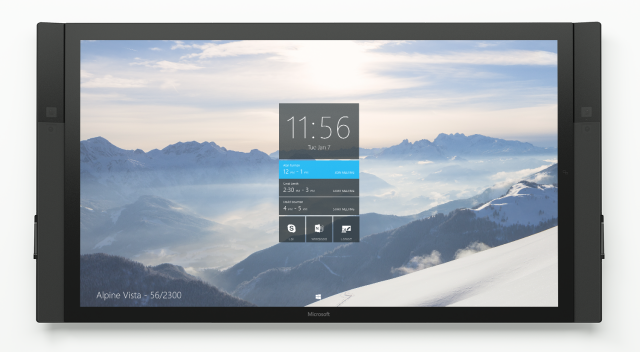 So you may have heard that Microsoft announced to the world a Surface Hub for workspaces. Initially I thought it was just a big interactive whiteboard (IWB) and thought no more. I kept an eye on it in the news and seen that the date of launch was slipping etc., so was wondering would it ever take off. I then got invited to see a demo and have a play with a prototype unit and the timing of this was excellent as I had received a tender where the client requested these. Obviously Microsoft is out there talking about it to various clients. At a first glance, it’s a large screen, 55” or 84” variants that can be on a trolley to be moved around or fixed to a wall or a combination bracket of mainly floor stand taking the weight but being fixed to say a studd wall too (stands and wall mounts are chargeable options). The first thing I did was pick up a pen (which charges when docked in the magnetic slot on the side of the screen) and started drawing and making a mess. So far, it’s a IWB. What then impressed me is that my colleague grabbed the pen from his side of the screen and started annotating, we were both marking up at the same time. Brilliant collaboration. We were then informed that the device has 100 touch points and it can use up to 3 pens at the same time. My thoughts around how the device would be used is firstly it is a replacement for the display in a collaboration space, then secondly an IWB and finally a video collaboration device. So for use case number one, how do you connect to it? Most users walk in a room and use the VGA/DVI/HDMI/DisplayPort cable and present screen (usually after about 5 minutes of Fn+F7, WinKey+P etc. etc.). However, I had my Surface Pro 3 with me and hit WinKey+P and searched for devices. It immediately found the Surface Hub and I presented. I was not on any network, wired or wireless, it found it using Miracast (and Wi-Fi Direct). Awesome simplicity. Imagine a world where there are no cables in a meeting/huddle space!! Also as part of the Miracast, audio is also transmitted, so playing a video clip wirelessly was very cool. Think of it like an Apple TV with AirPlay with iOS devices and Macs. However, how many organisations have completely Mac’s, you need seamless platform for the majority of the users initially. So Miracast is supported on Windows 8.1 or higher and Android. For some reason my Android (LG G3) did not work with the Surface Hub, probably due to it being a prototype I suspect. Simple, cable free collaboration. Next up was taking the content from anywhere, not necessarily from the connected source, as the Surface Hub is a Windows 10 device, it can access (if allowed obviously) numerous sources such as the Internet, documents on a file share, OneDrive for Business, SharePoint etc. Just open it up and start annotating. The clever bit now is that rather than having to take a photo of the whiteboard like in the past, just send the annotations to your email as images and OneNote’s. Remember the Surface Hub can be connected to the network (wired or wirelessly) so has access to mail and calendar. The other useful piece is that the home screen lists what meetings are booked out, so if someone is trying to see if a room is free, they can just walk up to the Surface Hub and see the room’s calendar. Finally, visual collaboration. This is what I was most interested in, understanding could it replace the standards based video codec such as Polycom, Cisco, Lifesize, Sony etc.? Interestingly, the camera is not on the top bezel like on a laptop, there are in fact two 1080p cameras, one of each of the side bezels. This allows for the remote participants see person whilst annotating. Very clever. This demo unit was having issues with calling people so I was only able to experience the video in loopback. As most meeting rooms are setup like bowling alleys, the Surface Hub won’t replace the standards based codec in the room. However, this then creates an end user nightmare. So it got me thinking. As the Surface Hub has USB inputs, why not add a Front of Room webcam such as the Logitech 930e which is shipped with Lync Room Systems and the new Polycom Trio. It is an excellent camera. When in a call with the Surface Hub, you can select which camera you want to use. My next thought was then how about added a Polycom CX5100 to the centre of the room, so you could get the centre of the table and the present when annotation. I know clients will ask these questions. Obviously both these scenarios are untested yet and final code is to be released, but there are possible options for making the Surface Hub a one stop shop. So, for video calling, obviously you can search the directory and find a colleague (internal or federated) and give them a call using the Skype for Business client. This also allows access to the AV/MCU so you can have a multiparty call. Now imagine the scenario where you need to call a standards based H.323 room system. With Polycom of course this is seamless as their native integration between the two platforms. However, with other technology, you would have to meet n a virtual meeting room, where there is some transcoding going on between H.264 AVC and the Microsoft H.264 SVC codecs. This is all transparent to the user, but it certainly needs some planning and consideration rather than just deploying some and hoping they will work with everything. I can see this being a game changer for organisations wanting to evolve their workspaces and get away from the traditional conference/meeting rooms. The Surface Hub will be on display at Future Decoded next month in Excel.